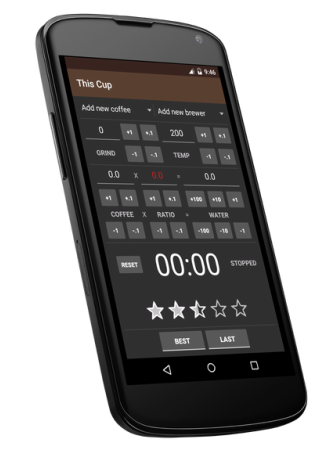 A coffee ratio calculator, a coffee timer and a cup rating system in one convenient app. Load your last or best cup parameters. The Speed Ratio Console. The SRC was designed to quickly modify coffee, water and the ratio for your beans. Load your best cup and the adjustment buttons make it super quick to re-adjust in no time. Smart locking allows water to impact either ratio or coffee. The stopwatch tells you the time every 30 seconds, so you won't forget even if you get distracted. Rating saves your cup, nothing else to do! Add, delete and disable beans and brewers. Disabling means these choices won't clutter up the main UI, making it faster to choose a bean/brewer combo. Graphs show you your last 30 cups, to get a quick overview of what you seem to prefer.